Would you like to dub your video files? If you care to, perhaps you should first do some voice over work so that you are capable of adding voice to video. Under various circumstances, people need layer their voice recording over videos. For instance, users who wanna add voice to video gameplay. Or else, some of you hope to make a voice over demo for sharing and uploading on social network sites as well as make a documentary for some important stuff. As the above said, it would be essential to add voice-over to a video. To do this, it takes two steps to get things done. Your first step is to record your own voice and the second one is to add it to a video. For windows users: Generally, a kind of video recording and editing software is required. Well, the top rated program is windows live movie maker, which is also the most user-friendly tool for majority of users. Be specific, its features stand out in comparison with any other ones because it is entirely free and offers real ease of use. You can add narration or sound to a video file or any selected video part. Note here, If you desire to change the dialogue what actors say in a movie and replace with your voice, it’s a novel idea to mute the audio from video file first. In live movie maker, change the volume of the selected video and turn it to silent. That’s right, it does not break a sweat to add voice to video. Whereas, how can you record your own voice and then start adding? As we all know, the windows sound recorder is the system-provided buttons. Quickly navigate to All programs – Accessories – Sound Recorder. Plug in your microphone and start recording your own voice. For mac users: The above method is apt for working on windows system, a better alternative for mac users is using audacity and iMovie. Audacity is a free utility that enables users to record sound coming through microphone. After recording your own voice or wanted sound, just import it into iMovie editor. You will be able to add sound to a video with great ease. There’s still another case that you are demanded to add voice to video. That is, make voice over video demo. In particular, users will do this by the means of recording audio and video simultaneously. You can do the recording as long as you have a nice screen recording software or good-quality microphone. 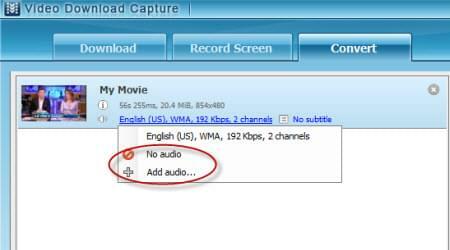 Video Download Capture features screen recorder that support recording screen as demo videos. Come first to experience it. After installing the program on your PC, click “Record Screen” feature. Do some general settings for recording, choose “microphone” or “system sound and microphone” as your output source. Then you could record every movement on the screen and save it as a video file. Apart from this, this app also features video downloader, editor and converter. Assuming that it is necessary to have the aid of online video sources, you are allowed to download videos here. Afterwards, add videos for converting, mute the source file by clicking “No audio” and then add your wanted sound. That’s done. All these methods are appropriate for amateur user-generated video content and you know how to add sound to a video. If you wanna be more professional, you’d better accomplish it in a recording studio that excels in adding melodic sound effect, mixing and polishing your voice etc. Then you know exactly how to get it done with the best effect and record your own demo tape.